As the Red Sox take first place (with Tampa) in the AL East, we thought we would share some news with you. THE JOY OF SOX MOVIE - THE MUSIC! Check out Rob's blog to hear another of his songs: "I'm a member of Red Sox Nation"
THE JOY OF SOX MOVIE HITS THE EDITING PHASE! The Joy of Sox is now in the editing phase! We're hoping to have a first cut by late fall/early winter. We are actively seeking funds to help us finish the film and send it on it's film festival tour and possibly commercial broadcast. In August, Producers Joel Leskowitz, Karen Webb, and Rick Leskowitz were interviewed by Doug Miller of MLB.com on The Joy of Sox Movie. Look for an upcoming article close to post season on MLB.com. THE JOY OF SOX IN THE BOSTON GLOBE! In August, The Joy of Sox was featured in the Boston Globe. Karen Webb & Dawn Morrissey, producers of Green Grass, a short narrative film that deals with illegal immigration and a 2007 RIFC project, are pleased to announce that Green Grass will be screened at the 9th Annual Pawtucket Film Festival on Sunday, September 21st, at 4:30 PM at the BLACKSTONE VALLEY VISITOR CENTER, 175 Main St, Pawtucket, RI. Admission is $10 at the door or at www.ARTTIXRI.com. Admission includes short films, a feature film, live music, refreshments, a free t-shirt, and Q&A with all filmmakers. Green Grass was filmed last summer in Hopkinton, Framingham, Providence, and Pawtucket. 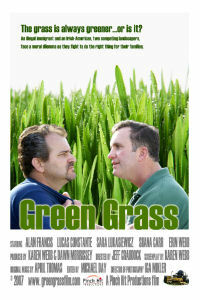 More information about Green Grass can be found at www.greengrassfilm.com. Information about the Pawtucket Film Festival can be found at www.pawtucketartsfestival.org. During the screening in Pawtucket, Karen Webb will be showing the new Joy of Sox film trailer. If you attend the screening, you'll have a chance to take a sneak peek at The Joy of Sox! !